The conclusion to be drawn from the Obama administration’s predictable and predicted failure to get an Israeli-Palestinian peace process going is that the Zionist (not Jewish) monster state is beyond control. And the question arising is this. What are the real choices for the Palestinians? Musharaf then said, “There are no principles in politics“. That explanation is not only disingenuous (dictionary definition – “not frank or open; merely posing as being frank and open; crafty, devious”). It is historically dishonest. The truth of history is that the Palestinian leadership demonstrated the political will and took the tough decisions necessary for peace on terms any rational government in Israel would have accepted with relief more than 34 years ago. It happened in 1979 when, by 296 votes in favour and only 4 against, the pragmatic Arafat persuaded the PNC, the Palestine National Council (more or less a parliament-in-exile) and then the highest decision-making body on the Palestinian side, to approve his policy of politics and what had been until then unthinkable compromise with Israel. The true nature of the compromise for which Arafat secured overwhelming PNC support more than 34 years ago can be simply stated. It required the Palestinians to make peace with Israel in exchange for its withdrawal from the occupied West Bank and Gaza Strip (land grabbed in a war of Israeli aggression not self-defence) to make the space for a Palestinian mini state with East Jerusalem its capital and/or the whole of Jerusalem an open, undivided city and the capital of two states. In other words, the Palestinians were ready to make peace with Israel in exchange for the return of only 22 percent of their land. While not recognizing Israel’s “right to exist”, they were recognizing its actual existence on the other 78 percent of their land. Only Arafat (no other Palestinian leader) could have persuaded the PNC to be ready to make peace on that basis. What he needed thereafter was an Israeli partner for peace and there wasn’t one. There’s a case for saying that Prime Minister Rabin might have been the Israeli partner for peace Arafat needed but he was assassinated by a Zionist zealot who knew exactly what he was doing – killing the peace process that had been set in motion by the Rabin-Arafat handshake on the lawn of the Clinton White House. One indication of how troubled Zionism was by Arafat’s success in preparing the ground on his side for peace on the basis of a viable mini state for the Palestinians was the decision in 1982 by Israeli Defence Minister Sharon to order an invasion of Lebanon all the way to Beirut for the prime purpose of exterminating the entire PLO leadership and destroying the organization’s infrastructure. (The PLO as a “terrorist” organization was something Zionism could live with. The PLO as a partner for peace was not). The honest explanation for Kerry’s failure to get a real peace process going can also be simply stated. Obama lacks the political will to confront the Zionist lobby and its traitor agents in Congress. That is what he would have to do in order to use the leverage America has to try to oblige Israel to be serious about peace on terms the Palestinians could accept, and which would be in accordance with UN Security Council resolutions and international law. (I think it is correct to describe the Zionist lobby’s stooges in both houses of Congress as traitor agents for the simple reason that it’s not and never has been in America’s own best interests to support the Zionist state of Israel right or wrong). As Obama was preparing to wash his hands of the conflict in and over Palestine that became Israel and walk away from it (not least because funding for the mid-term elections to Congress is underway), Israeli Prime Minister Netanyahu came out with a statement that was outrageous even by his own standards of duplicity. The Palestinian leadership, he said, had had a choice to make – “Peace with Hamas or peace with Israel.” They could not have both, he asserted, and they had made the wrong choice in going for a reconciliation with Hamas. The Netanyahu notion that Israel’s leaders are open to peace on terms the Palestinians could accept is also complete, absolute, total propaganda nonsense. Zionism’s demolition of Palestinian homes and theft of Palestinian land and water – ethnic cleansing slowly and by stealth – continues. So given that the Zionism’s monster state is beyond control, what are the real choices for the occupied and oppressed Palestinians? In my analysis there are three. One is to abandon their struggle, surrender to Zionism’s will and make peace on its terms. This would give the Palestinians a few isolated bits of West Bank land, Bantustans, which they could call a state if they wished. In this scenario the Palestinians would be doing what they refused to do in 1948 – accepting their lot as the sacrificial lamb on the altar of political expediency. Another choice is to let events take their course as dictated by Zionism. In this scenario the most likely end game is a final Zionist ethnic cleansing of Palestine. (In my view a resort to armed struggle or violent confrontation in any shape or form is not a choice the Palestinians should make because it would play into Zionism’s hands and give Israel’s neo-fascist leaders the pretext they would otherwise have to create themselves to proceed with a final ethnic cleansing). The third choice is to change the political dynamics by demanding and obtaining the dissolution of the corrupt and impotent PA (Palestinian Authority) and handing complete and full responsibility for occupation back to Israel. This, as I have indicated in previous articles, would impose significant security and financial burdens on Israel and, more to the point, it would make calling and holding the Zionist state to account for its crimes something less than what it currently is – a mission impossible. As I have also asserted in previous articles, the momentum generated by changing the political dynamics as indicated above would be greatly assisted by the Palestinian diaspora putting its act together and becoming politically engaged for the purpose of bringing the PNC back to life, re-invigorated by elections to it in every country where Palestinians are living. This would enable the Palestinians to be seen to be determining policy by truly democratic means and speaking with one credible voice; and that in turn would assist them to deploy the only weapon they have much more effectively than has been the case to date. The justice of their cause. Because there are no principles in politics I agree with Susan Abulhawa, the Palestinian author (and also the founder of Playgrounds for Palestine, an NGO for children). In a recent article she said there is nothing for the Palestinians in negotiations with powerful elites which, I add, either do Zionism’s bidding or are frightened of offending it too much; and that it is time to take the struggle to the “global street”. What she meant and said in her own eloquent way is that is that Zionism’s oppression of the Palestinians does not appeal to popular notions of morality, and that if enough citizens of conscience everywhere were aware of Zionism’s on-going destruction of an indigenous population, they could be mobilised to demand justice for the Palestinians. On that basis Susan Abulhawa sees hope for her people. In principle so do I, but there’s a troubling question that has to be addressed. What, really, explains why the Zionist state of Israel is not interested in peace on terms the Palestinians could accept? Over the years I have written and said on public platforms that most Israeli Jews are beyond reason on the matter of justice for the Palestinians. To my way of thinking the best explanation of why this is so was provided by Israeli journalist Merav Michaeli in an article for Ha’aretz on 30 January 2012. The headline over it was Israel’s never-ending Holocaust. Here are five paragraphs from what she wrote (my emphasis added). The Holocaust is the sole prism through which our leadership, followed by society at large, examines every situation. This prism distorts reality and leads inexorably to a foregone conclusion… that all our lives are simply one long Shoah (experience of persecution and extermination – my amplification not Merav’s). The ‘Hitlers’ are always there: Just a week ago, Prime Minister Benjamin Netanyahu said for the nth time that there is no shortage of those who want to exterminate us completely. In other words, there is no lack of reasons to continue to reinforce the fear of the Holocaust which, according to his father, historian Benzion Netanyahu, has never ended. There will no doubt be some and perhaps many anti-Zionists who will welcome the prospect of Israel self-destructing. I don’t because of what Golda Meir said to me on camera in the course of an interview I did with her for BBC Television’s flagship Panorama programme. I believed her then (as did the writer of the lead editorial in The Times which quoted what Golda said to me) and I still do. No, dear readers, it was not U.S. Secretary of State Kerry! According to veteran Israel journalist Hirsh Goodman it was David Ben-Gurion, Israel’s founding father and first prime minister. Unlike Kerry Ben-Gurion did not offer a grovelling apology for using the “A” word. My friendly American Jewish blogger Roger Tucker has always called the said pape 'The Jew York Times'. More and more Israeli Jews are waking-up to the reality that Israeli army is not to protect Jewish lives but to carry out Zionist agenda of grabbing more foreign lands by military aggressions. On this Memorial Day, Lior Ben Eliahu, the brother of Tamar Ben Eliahu, who died in a Jerusalem bus bombing, penned an open letter addressed to Israeli defense minister Moshe Ya’alon saying that Israeli regime is not interested in peace and quiet. “I ask you, Defense Minister Ya’alon, on this Memorial Day, for a bit of personal soul searching. Have you yourself helped push Israel and its citizens toward “peace and quiet?” Do you really “strive for peace?” Even before you were appointed defense minister, you announced that there is no place for the establishment of a Palestinian state. And specifically this past month, when the peace process ran into difficulties you decided it was the right time to approve the expansion of Jewish settlements in Hebron and violate the status quo there. Furthermore, you decided to approve the expropriation of 984 dunams of private Palestinian land in the Gush Etzion settlement bloc, and to declare them state lands for the purpose of expanding the settlements of Neve Daniel, Elazar, Alon Shvut and the illegal outpost Nativ Ha’Avot. These actions, along with your opinion on the establishment of a Palestinian state, force me to wonder what the word “peace” means to you, and whether you are truly interested in peace. Are you truly interested in leading Israeli citizens toward peace and quiet, or perhaps towards new settlements to be built between as many Palestinian villages as possible?,” wrote Eliahu. To those of us who have for a long time taken an interest in the situation, it is no surprise that the talks 'failed', when the Israeli government had no intention of conceding anything in the first place. As with all previous 'peace talks', the whole thing is a charade to give the Zionists the excuse that it was the 'Arabs' who walked out. The problem is, though, that Zionists are so industrious that they have so much hasbara under their control. There is even a group on Facebook against BDS. We need to let the world's media know much more about what is going on, but how I do not know. This week's article makes the strong point that Hamas can indeed be negotiated with. The wonderfully articulate Uri Avnery expressed this in his weekly post only recently: that you can often get further with you enemies by reaching out to them; but one argument I often encounter with Zionists online is that the Hamas Charter still calls for the destruction of Israel. As I find the turgid document so difficult to wade through, I was wondering if someone could offer some enlightenment on this? Isitreal has never courted Peace in any negotiation that has ever occured since 1967. Or before 1948. They were then Given just enough "Territory of the Palestinian Lands...to Stand on and Build off of. No way Were Those Land Grabbers going to take a chance of having to back off of even one square inch of it. Peace with the Palestinians..Whose Lands were Stolen from them ? Give me a Break ! What these Thieves and Squatters must Realize..is that What was Taken Must be Returned..And If It isn`t... Then More Troubles will Be forthcoming,m And This will Come from World Opinion...Against The Land Grabbers...Isitreal. Every day this horror venture of oppresion Goes unsettled >>The Worst The Outcome will be for ISITREAL. As an Arab citizen in Israel, I really do not want to see it self distruct. Living in an Egypt or Syria like (not to mention PA) country is a terrifying thought. Unfortunately it seems like our brothers in Palestinian leadership will again make the worst choice. Alan , Your Article is Quite insightful...As Usual. But WHEN are we ever going to Travel Past the holocaust...and stop allowing This event to be used constantly. 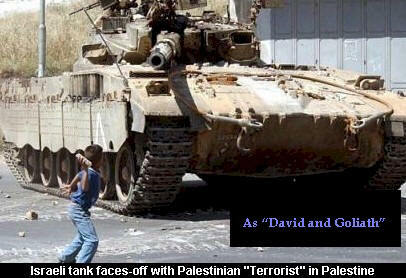 We all know it is a Rusty Weapon now..that really does not Help the cause of these zionist in any manner. The world is So Fed up with Hearing about it..There has been Too many Other atrosities that Have transpired all over the Universe..[That Other Peoples Do not Attempt to USE for Fodder for generations.] Please..write One Article concerning The Palestinian- Isitreal 'Stand=off' And Let the holocaust REST. I`m sure, It is Near time that The Palestinians are going to Win this Terrible Situation That has been Leveled Against them..for Years. And It will come about strictly due to World Opinion Aimed Against Isitreal..Because of The Confiscation of Palestinian Territory and subjecting the Lawful Residents of the Land..to Atrosities of All kinds..in the attempt to Get Them OUT. For Shame, b.Netty.